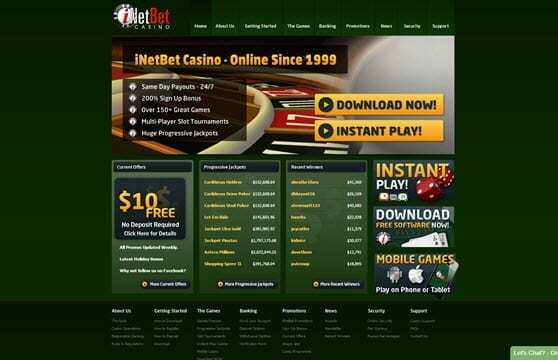 Inetbet Casino No Deposit Bonus Codes - GET $10 FREE! 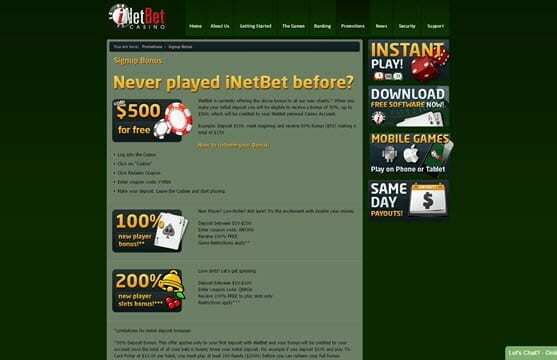 Active since 1999, iNetBet Casino is one of the oldest online casino existing. Licensed in Costa Rica and powered by Real Time Gaming. With the time it expanded and reached the huge number of half million players. The online casino welcomes players from the US, working as a solution for the online market in the US. When players sign up they receive different types of iNetBet Casino bonuses, among which they have to choose the moment they make a deposit. The first bonus is a No deposit $10 Free at Sign-up New Player Account. Making your first deposit you can choose among a 50% up to $500 for All Games or a 200% up to $200 Bonus only for Slots Games. 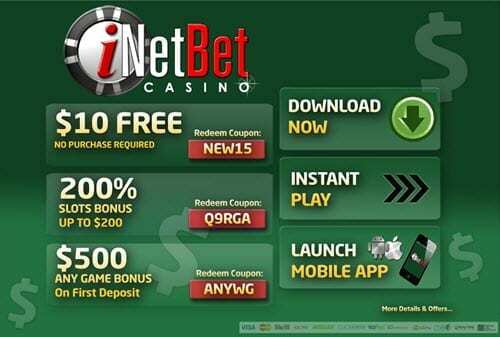 After entering the iNetBet Casino promo codes at the cashier, players will have them automatically available on their accounts. Among the iNetBet Online Casino bonuses, players will have the slots bonus to use on the machine they wish, or they will receive Mystery, Match or Return Bonuses. Alternatively, a series of casino game promotions are available, including Holiday Promotions. Players can also take part to the casino programmes: Comp Programme works with every bet where comps are earned and can be converted in cash; Wager less programme allows players to stick to their budget. RealTime Gaming provides online casino iNetBet with realistic gaming experience for a huge selection of video slots, which include Warlock’s Spell and Oriental Festival, and games, like table games and video poker. 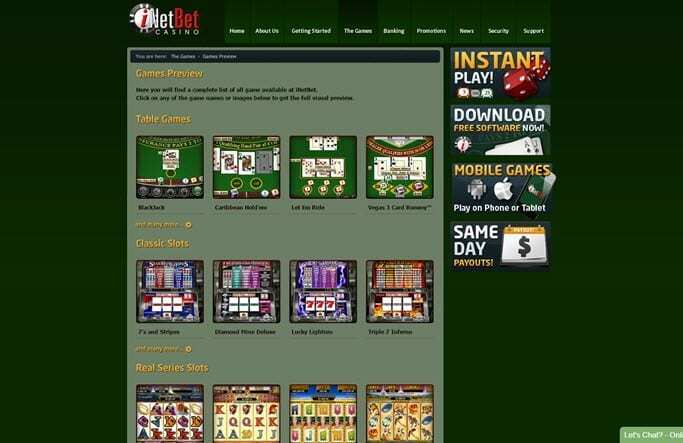 iNetBet Casino slots go from traditional three-reel like Diamond Mine Deluxe to real series slots, which offer multiple jackpots, Random or minor, including winning line combination ones. Table Games include several variants of Blackjack, like European Blackjack and Pontoon, or different types of games like Roulette, Craps, Baccarat and Bingo. As for video pokers they offer the largest variety on the web like Jacks or Better or Joker Poker. Many are available in single-hand or multi-hand combination, like Double Double Bonus and Bonus Deuces Wild. iNetBet Casino takes care of its players’ information security by using 128-bit SSL encryption, so that data are obscured to external sources. A layer more of security is added to protect all the transactions. Moreover all the games are accurately tested by a random generator number which ensures the highest fairness in gaming. This is certified through a TST seal of Casino page. If you need any kind of assistance, the casino online provides email support, which works 24/7. The employers reply within few hours giving the most helpful replies to solve players issues, and in case it is serious the request will be passed to one of the managers.